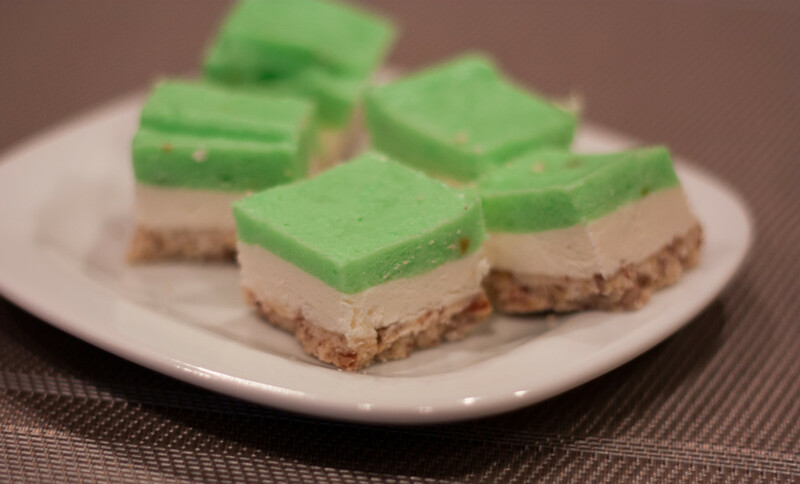 My adaptation of pistachio pudding bars is one of my older brother’s favorite desserts! And despite that they are made in steps or layers, pistachio pudding bars are quite easy to make. The crust has pecans in it. I like to buy whole pecans in bulk so I keep them in the freezer until I need them–then they don’t go rancid. Sometimes I chop up several cups (or use the food processor) and store them in the freezer in ziploc bags with the date written on them. This little tip is essential: always sort through bulk pecans to make sure no shells are still attached to the nut meat. Just when I think I don’t need to sort, I find a shell! It never hurts to be careful! 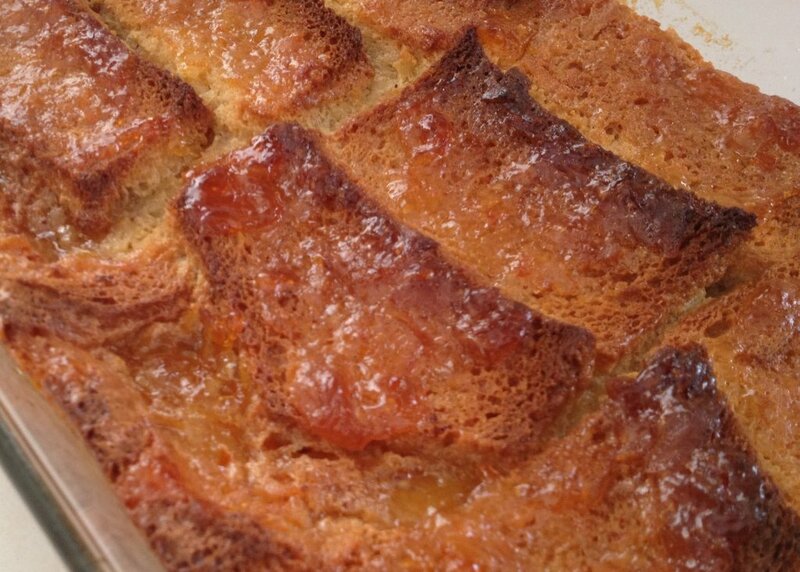 Since these are one of Keith William’s favorite desserts, here’s “My Favorite Things” sung by Julie Andrews. And since this song is immortalized by two greats–Julie Andrews and John Coltrane, I’ve included Coltrane’s instrumental version of “My Favorite Things,” too! Preheat the oven to 350 degrees. Line a 13 x 18 inch jelly roll pan with parchment paper. Set aside. In a medium bowl, cream butter and sugar together. Add flour and mix until combined. Mix in the pecans and vanilla. The dough will be crumbly and slightly dry. Press dough evenly into the lined jelly roll pan. Bake for 20-25 minutes until golden brown. Crust may puff up a little during baking, but will fall once out of the oven. Allow to cool. In a medium bowl, whip the cream cheese until smooth. Add powdered sugar and beat until silky in texture. Add vanilla and whip until incorporated. Add a 1/3 cup of the whipped heavy cream to the bowl and whip. Then fold the rest of the whipped cream in by hand. Dollop onto the cooled crust and then spread until the whole crust is covered. In a large mixing bowl combine pudding mix and milk and whip until thick. Make sure to break any pockets of mix by scraping down the bowl and running a rubber spatula through the mixture. If Mixture is too runny, put in the fridge for a couple of minutes to thicken. Once thickened, dollop onto the cream cheese layer and spread until the cream cheese is covered. Put in the refrigerator or freezer to firm up. To store, freeze the entire tray. Remove the bars by picking up with the parchment paper and put on a large cutting board. 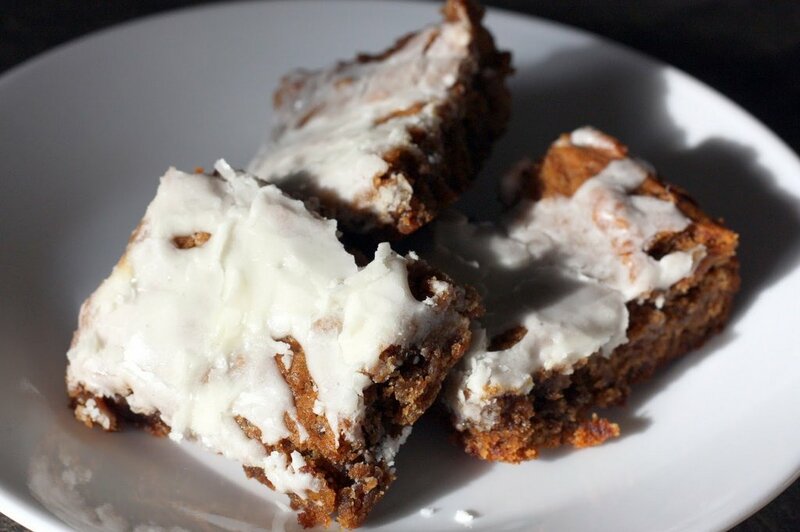 Let the bars sit at room temperature for a few minutes. With a large knife, cut into rectangles. Line an air-tight container with waxed paper. Put the bars in the container in one layer. Put another piece of waxed paper on top of the first layer of bars and add another layer. Repeat until the container is full. Store in the freezer. Choose your favorite flavor of pudding mix and substitute it for the pistachio pudding mix. Previous post: Just in Time for Torte!